My Air Fryer is mostly a french fry fryer, so I thought I would try brussel sprouts in the air fryer. This recipe has three ingredients, not counting any sauce. Some of you are probably a little more experienced with the air fryer then I am. I have not had it very long, but I plan on trying out some new recipes using this wonderful machine. Combine all the ingredients into a bowl and toss until the brussel sprouts are coated with the seasoning. I have a Nuwave air fryer, The directions call for preheating at 400 degrees for 10 minutes. 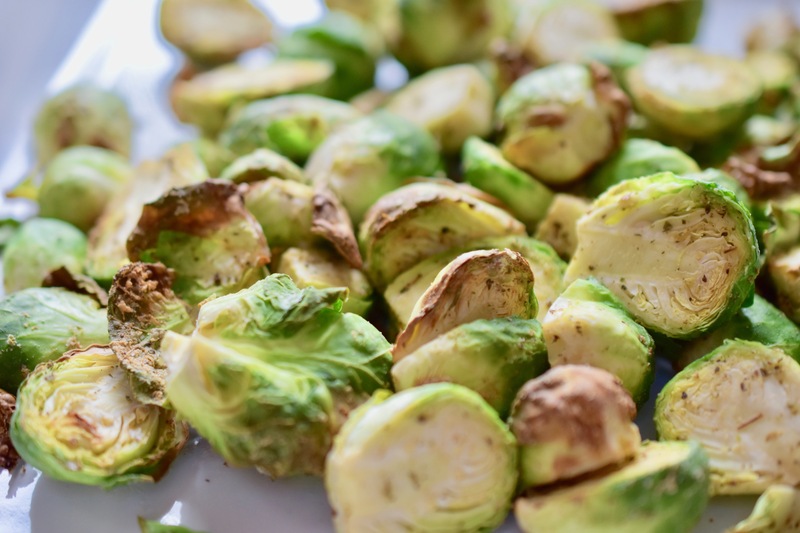 Add sprouts to air fryer basket and cook for 10 minutes. Pause cooking process to shake sprouts about half way through. The sprouts are done when they are fork tender and caramelized on the outside. Serve with your favorite sauce. I like maple syrup. You could do a combination of maple syrup and stone ground mustard. Both ways are tasty. Note: You may have to take out the smaller sprouts and continue cooking the larger ones. Interesting, I would never think to make them that way! It is so easy and they turned out great.